Unlike the Hunger Games - Mockingjay (did they really have to make that a 2 part film? ), there is so much happening within AI in the finance industry that I had to split this article into two parts so I can include all the projects within banks right now. Although my last article focused mostly on AI within trading and financial advisory, this article will focus on chat bots as well as using AI to combat fraud. In part one, I mentioned that Goldman Sachs hired one of Amazons top AI Executives and now even Alexa is considering her options at the shopping/healthcare/tech/cloud/delivery/legion of doom super power. Through the Echo product, UBS and Amazon have partnered together by trialing new Alexa skills to give wealth management clients the ability to ask Alexa certain financial and economical questions. Planned upgrades to Alexa will include her analyzing markets, booking in appointments with financial advisors and buying and selling stock on command. Other banks such as Capital One are also working on building Alexa skills to support customers and we should expect other virtual assistant applications such as Siri to also get involved in the coming months. Another project at UBS has been the building of a machine learning algorithm to scan vast amounts of trading data to create a strategy based on learning from market patterns. These strategies are passed to human traders to implement, although a discussion around reinforcement learning to create stock market strategies still has its flaws. Having racked up billions of dollars in fines for failing to prevent money laundering in the past, HSBC has partnered with tech start up Quantexa (a UK data analytics firm that uses network analytics and AI) to give real time analytics on billions of transactions. This software will potentially reduce investigation times, give case investigators access to all documents and transactions in one place and save billions of dollars for banks by preventing fraudulent pay-outs. Over the past 5 years, HSBC has turned to technology and, to date, has spent $2.3bn to help digitize the bank, research AI technologies and they have a $200m budget for investments into fin-tech start ups across the globe. With the Asian Fin-tech market experiencing huge growth with VC funding, HSBC have been part of that growth with their own investments as they aim to find and back the next unicorn in this space. On the consumer banking side, Bank of America have one of the most sophisticated chatbots within financial services right now. Erica is described as an intelligent digital assistant designed to help customers make smarter banking decisions (weirdly enough that was the same bio I used for my Tinder profile). Erica is programmed to help identify areas where customers can save money and work out bill payments. Potential areas of improvement are to conduct its own cost comparison for household bills to provide recommendations on better deals for customers. Bank of America are spending a lot on technology right now and this is a true global effort with positions across Europe and the US. COO Cathy Bessant said in a recent interview that Bank of America want to use AI to improve predictive modelling for how they can manage their own liquidity and balance sheet as well as help give customers access to credit in a more affordable and personalized way. Mastercard are using Artificial Intelligence to reduce the number of transactions that are wrongly declined. It does this by learning from every one of your transactions to fully understand your behavior and help detect any abnormal behavior from the account holder. Currently Mastercard have a 13:1 ratio of false positives which they are aiming to significantly lower with this technology. Barclays US are currently in the middle of launching a retail bank, with aspirations to compete alongside fin-tech firm Lending Club and Goldman Sachs lending product Marcus. Barclays have focused their AI efforts to give them a slight edge over the firms just mentioned by using AI to provide customer recommendations on ideal product they need based upon their financial health and personal circumstances. They believe this will also prevent miss selling and avoid scandals that have hit other firms such as Wells Fargo and Royal Bank of Scotland in recent times. Barclays are also developing machine learning technology to run text analysis on customer complaints. By using AI in this way they believe they are able to truly understand the root cause of the customers complaint to ensure the situation is best remedied and prevented in the future. 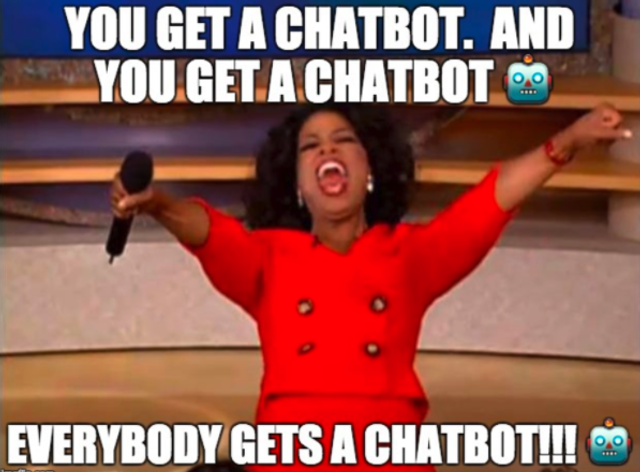 Like bold colors, Cardi B and the cronut, Chatbots are trending right now as every major bank is in the process of creating one. Compared to investment banks, consumer banks are focusing most of their effort and resourcing around the customer experience. Future projects in the pipeline in these firms are all tied into the banks digital strategy and banks have only scratched the surface of the chatbot. Over 2 articles I’ve discussed the type of projects each bank is doing right now and have provided some insight into what this means for hiring within this space, but what are the current threats to these businesses? “The largest threat to banks in advancing their AI agenda right now is directly linked to the talent shortage within AI” says me, Adam Butler, writer of this article. There are around 300,000 qualified AI researchers but there is expected to be over 1 million jobs in this space and salary levels are dramatically increasing. From recent financial filings, the estimated average salary for a number of AI teams falls around $300,000 - $350,000 per year. Another challenge is that nearly all AI leaders within these banks have shared similar views that recruiting from a diverse talent pool is part of an important process to developing efficient AI tools for customers. Purely hiring white, male, Ph.D graduates from Stanford within an age range of 25-30 won’t lead to successful AI products that cater to the diverse range of customers that banks work with and many firms are now looking at fostering and creating a diverse talent pool for these teams as AI, robotics, machine learning and distributed ledgers are invested in further. What AI projects have I missed? What other topics would you enjoy reading about? Email me your thoughts. Want to discuss your AI recruitment strategy? Considering a move? Drop me an email and lets schedule a call.